Roderick E. Wetsel is a founding partner at the firm of Wetsel, Carmichael, Allen, & Lederle, L.L.P. in Sweetwater, Texas where he has practiced law for 36 years. He is Board Certified in Oil, Gas, and Mineral Law by the Texas Board of Legal Specialization. Mr. Wetsel received a B.A. with high honors and special honors in History from the University of Texas at Austin in 1975. In 1974, while earning his undergraduate degree, he was elected to Phi Beta Kappa. He later received his J.D. from the University of Texas School of Law in 1977. Mr. Wetsel is an Assistant Editor of the Texas Title Standards Joint Editorial Board, where he has served as a member since 1991. 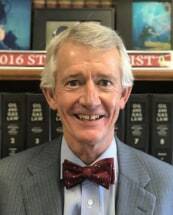 Mr. Wetsel was also a member of the Texas, Oil, Gas, and Energy Resources Law Council from 2003 to 2006 and currently is a charter member of the Kay Bailey Hutchison Center for Energy, Law, & Business. Mr. Wetsel currently teaches Wind Law at the University of Texas School of Law where he has served as an adjunct professor since 2012. The course is one of the first of its kind in the United States. In 2011, Mr. Wetsel co-authored the first treatise on Texas Wind Law with Professor Ernest E. Smith, Steven K. DeWolf, and Becky H. Diffen, which is published by LexisNexis and revised annually. In the 2015 edition, the title was changed to Wind Law to make the book more national in scope and is now co-authored by Wetsel along with Professor Ernest E. Smith, Becky Diffen, and Professor Melissa Powers. Additionally, Mr. Wetsel has written numerous other articles on wind energy as well as oil and gas law. He is a frequent speaker on wind energy issues throughout the United States.